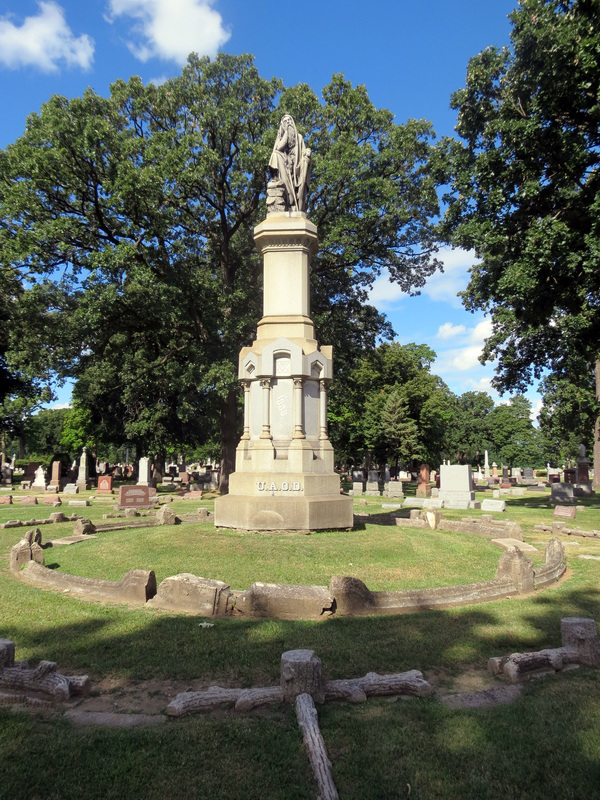 Located in section E, this is perhaps the most curious monument in Forest Home Cemetery. The United Ancient Order of Druids (UAOD), a fraternal order, was founded in England in 1781 by men who believed in the principles of "Unity, Peace, and Concord," as well as a Supreme Being. The true history of the ancient druids is shrouded in legend and myth, but the name was applied to priests among Celtic tribes. Religious ceremonies were held chiefly in oak groves and along rivers and lakes, and the circle symbolized the Supreme Being. The UAOD based its ritual on the history and legend of these ancient druids. 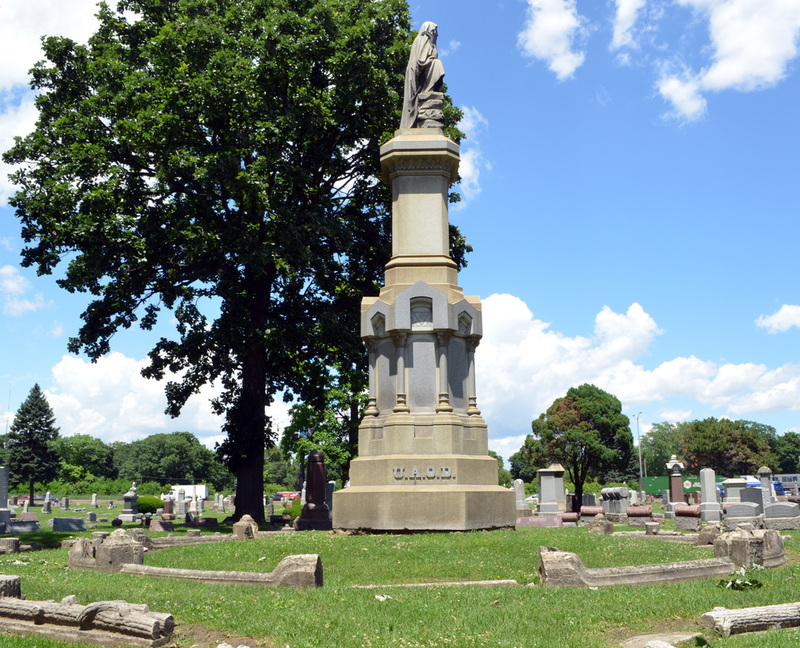 In 1883, Chicago was home to sixteen local UAOD lodges, called "Groves." 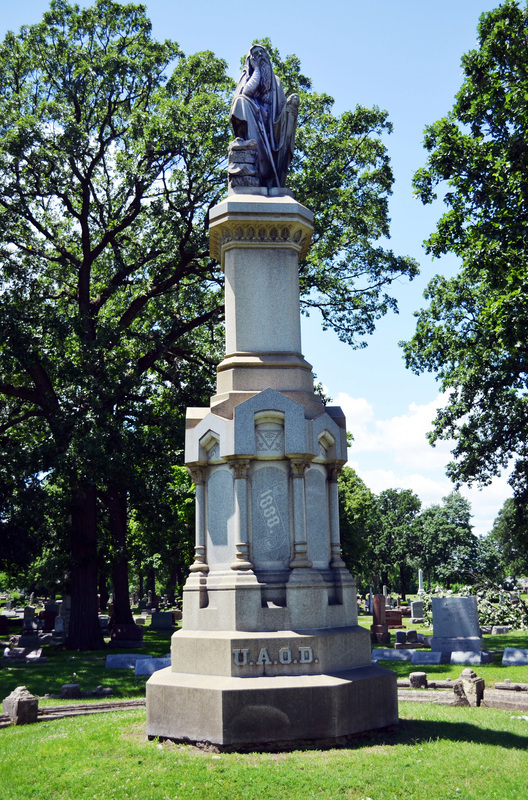 This monument, erected in 1888, contains many of the symbols associated with this order: the "logs" arranged in concentric circles around the central monument, the all-seeing eye within the triangle, and the shrouded figure of the Druid atop the monument. The inventors of Halloween, the ancient Druids—religious leaders of the Celtic race who once ruled the forests from Germany to Ireland—have their own "Stonehenge" in Forest Park's Forest Home Cemetery. The Druids celebrated the last night of October in honor of "Samhain," the Lord of the Dead, who on Halloween night assembled the souls of all who had died during the previous year. These souls were trapped in the bodies of animals, thus the Druids sacrificed animals on Halloween to free the souls. They also sacrificed a few humans, usually criminals, who were burned alive in wicker cages. On a night in which ghosts were flying, the Druids lit bonfires on the hills to ward off the evil ghosts. The Druids also invented trick-or-treating. They would dress up as animals and proceed from one home to another, soliciting contributions for the Druid god "Muck Olla." Those who didn't pay up were subject to pranks, which afterward were blamed on witches and goblins. This isn't to say Druids were trick-or-treating back in 52 B.C., when they were encountered by Julius Caesar. Caesar called the Celts "Gauls" and found them to be a fierce enemy who lived in circular stone houses surrounded by high stone walls. Caesar was impressed by Celtic fighting ability and with some of their religious practices. "Funerals," Caesar wrote, "considering the Gaulish standard of living, are splendid and costly." Caesar likely would have found the Forest Home monument true to the Celtic spirit. 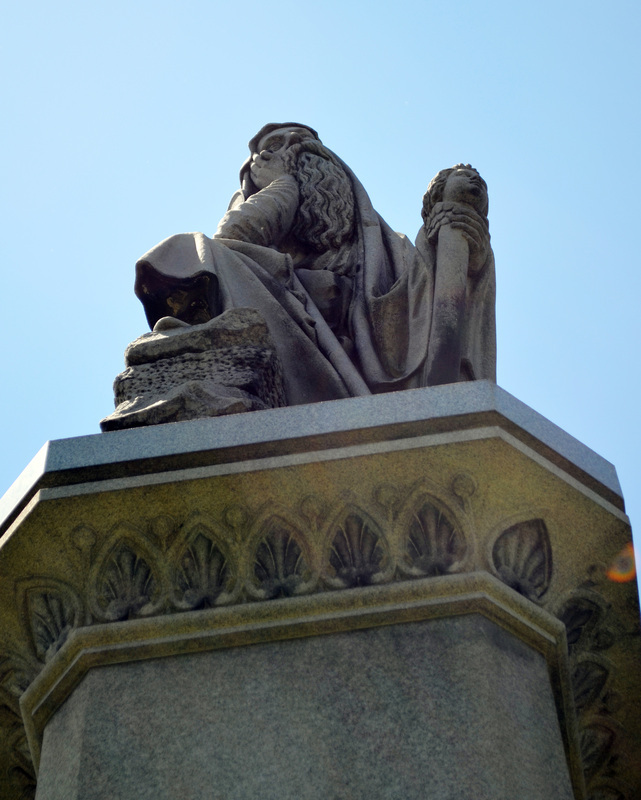 The monument wasn't erected by a first-century tribe, of course, but by a19th-century benevolent society that imitated the secret practices of Druid priests.The monument's pedestal bears the initials U.A.O.D. and the year 1888. No one knows who carved the monument, but it was the United Ancient Order of Druids, a secret society founded in London in 1781 by a carpenter named Henry Hurle,who placed the monument in Forest Home. In looking at a map of Forest Home, the Druid monument is a circle of graves in a sea of straight lines. This is in keeping with the ancient practices of the Druids,for whom the circle was the symbol of the "supreme being." Druids used stones of great size in their rites. 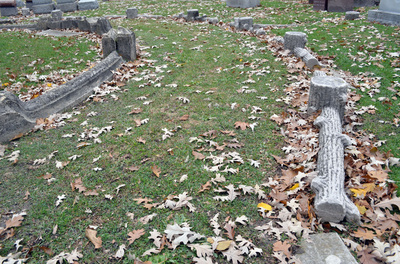 At Forest Home Cemetery, a circle of large stones rings the pedestal. There are two more circles around these stones, formed by oak logs cast in cement. The Druids held the oak tree as sacred and conducted their rites in oak groves. In (act, the U.A.O.D. called its lodges "groves." Druids practiced a nature-centered religion much like Native Americans. They worshiped the oak because it was prone to lightning strikes, perhaps symbolizing their most powerful god, the god of thunder. The statue at the top of the pedestal hast he long beard and long sad face associated with the magician, Merlin. He carries over his shoulder a sickle with a blade shaped like a crescent moon. Druid priests carried a crescent moon as a symbol of immortality. His other hand rests on a harp, which bears the head of a young man. The Druid priests were "the memory of the people," keeping alive the stories and legends from antiquity. They were bards who composed and sang the old Celtic songs. "Bard," in fact, was the title (he U.A.O.D. gave to those who became second-degree members. 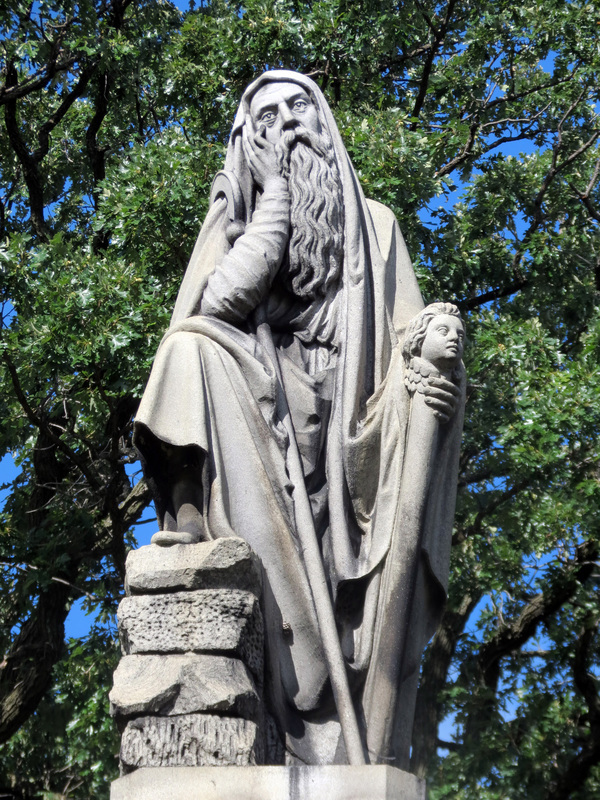 In Europe, Druid priests would be honored by statues set up in prominent places, where all could see them and be reminded. The statue in Forest Home is a reminder of those ancient times. One of the mysteries of the Forest Home circle is the that graves hold persons of German extraction. As Caesar said, "The Germans differ much from the (Celtic) manner of living. They have no Druids to regulate divine worship." 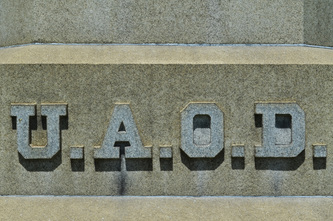 The answer to the mystery lies in the U.A.O.D., which in 1872, spread from England to Germany. The planters of the pedestal and statue must have been recent immigrants from Germany. 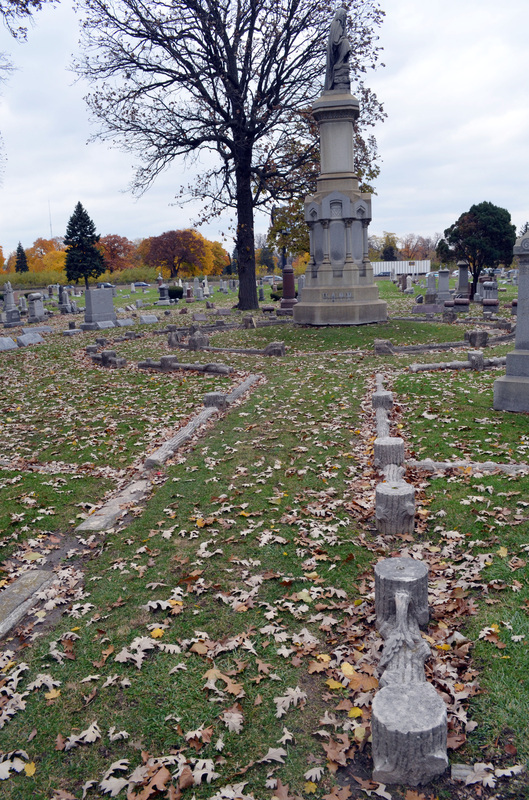 Also, the section where the monument stands was once part of Waldheim Cemetery, a cemetery founded by German lodges. Pat Kautz, who works in the Forest Home office, helped establish the link between the persons buried in the circle and the monument they faced when he found a warranty deed for the graves, written in old-fashioned script and dated Jan. IS, 1875. It lists John Fellger, Theodor Hahmann and Charles Mathai, as "Trustees of the Druids" Cemetery in Waldheim, Cook County, Illinois. "The initials "U.A.O.D." are stamped on the document. The U.A.O.D. was one of many fraternal organizations that sprang up in the late 1700sand 1800s, though they claim roots back to Biblical times. Members paid modest dues and were taken care of by other members of the group. In fact, the motto of the U.A.O.D.was "United to Assist." 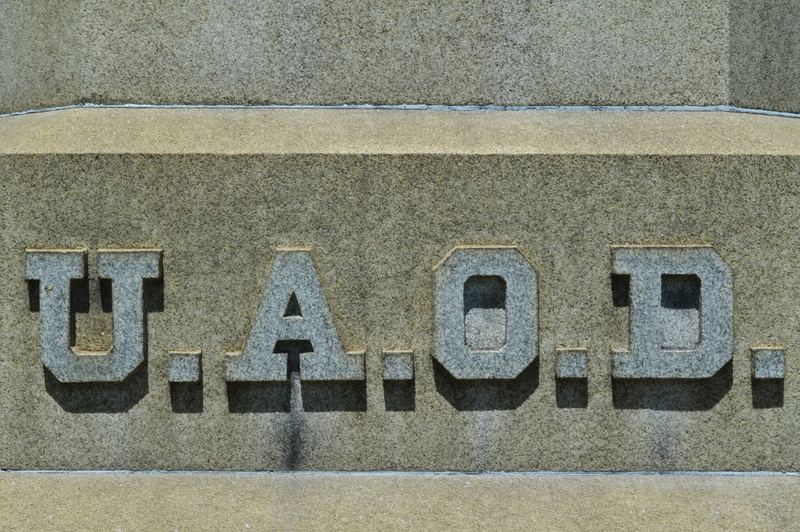 It's estimated that at one time 50 percent of the American population belonged to fraternal organizations. Secret societies were the rage and they took the place of many of the social agencies we have today. They provided for members who were ill or out of work and gave them a good send-off when they died. The main difference between these organizations was the style in which they conducted their rituals. In this regard, the U.A.O.D. had a spectacular back-ground to draw from. The U.A.O.D. 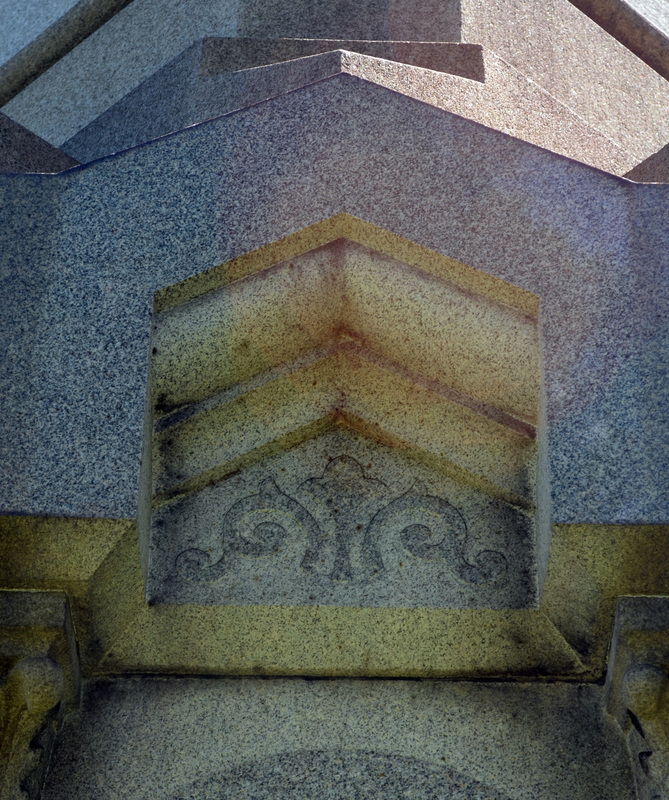 lodges—or "groves'—had altars consisting of three stones resting upon one another. Unlike their ancient ancestors,the U.A.O.D. did not use these altars for human, or animal sacrifices. What rites they conducted in these "groves" are unknown today because the U.A.O.D. was among the most secret of secret societies. But it is known that their laws were based on the magic and sorcery of Merlin. 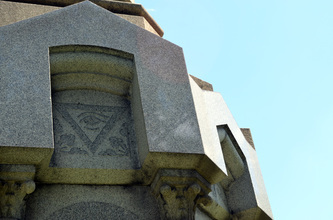 And, one of their symbols was the "all-seeing eye" in the triangle, which is carved into the sides of the Forest Home pedestal. Mistletoe, the sacred fertility symbol of the ancient Druids, was used in their rites. And oak groves were their favorite retreat sites. The United Ancient Order of Druids reached its height of notoriety in 1908, when they inducted Winston Churchill as a member. By 1923, they had reached a peak of 35,000 U.S. members, most of whom lived in the Midwest. But the order began to decline in the 1930s. It's believed the U.A.O.D.survived into the 1960s. By 1980 there was no response to inquiries sent to the organization. The U.A.O.D., like most lodges, did not allow women members. However, they had a women's auxiliary, called "The Circle. "To their credit, the U.A.O.D. included women in the sacred circle at Forest Home. This seems in keeping with the spirit of the ancient Druids, who gave women an almost equal standing under their laws. For example, women could marry the person of their choice; could own property, even when married; could divorce and were entitled to substantial damages if deserted or molested.These guaranteed rights of women were unique among ancient cultures. Christmas trees, kissing under the mistletoe, carving jack-o-lanterns—the influence of the Druids continues to this day and, in fact, seems to be on the increase as the celebration of Halloween be-comes more elaborate every year. So, if an old man with a sickle comes to your door collecting for Muck Olla, it would be best to pay up.